And hello from your other instructor – David Vogt. You can reach me at david DOT vogt AT ubc DOT ca. Please use a convention like that if you wish to reveal your email, because the WordPress platform we`ve chosen for the course is a public blog and you`ll need to be more aware of your postings than you might otherwise in an online course. 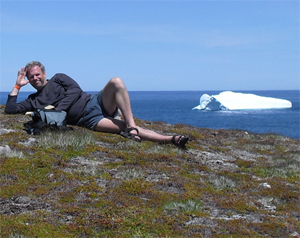 DavidV on NFLD's East Coast Trail last June. Yes, you`ve got two Davids as instructors: DavidP and DavidV. Rather than create two sections of the course, we prefer to bring everyone together as a means of crowdsourcing the great collective wisdom this group represents. This makes a big group, which is why making your introductions and building a presence for yourself through good posting is important. DavidP will be marking the group and participation assignments (Assignments 2 & 4) and I`ll be marking the essay assignments (Assignments 1 & 3), but we`ll both be involved throughout the course. Your big job this week is to make your introduction, review how the course works, and ask any questions. Also, please look at the Emerging Market modules (M4-M11) right away – if there any topics that are of special interest for you please let me know by the end of this week before we automatically assign people to their groups. Please enjoy the course – we`re looking forward to your contributions! I am interested in Mobile Technologies! Could you assign me to that group? Thanks! I’m interetsed in Collaboration Technologies. looking forward to the course. I am interesting in learning community environments. Thanks and I look forward to the course! Collaborative Technologies for me too, please! Looks interesting.